The Nigeria Football Federation is in disarray after meetings on Tuesday resulted in a controversial 'election' and a split in the governing body. Outgoing NFF president Aminu Maigari was to preside over a scheduled meeting to design a road map for elections to the NFF executive committee, to be held by 9 September. But Maigari, along with the secretary of the organisation Musa Amadu, was unable to attend because he was detained for "general questioning" by the Department of State Security. 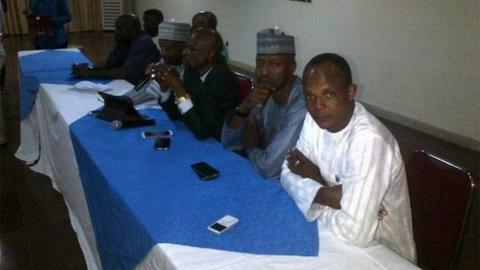 And in his absence Chris Giwa was elected NFF president by a group of members backed by the country's Ministry of Sport. However, a rival faction of members held a meeting later in the day where they decided not to recognise the election and called for another to be held on 4 September. Some of the delegates who had been to the first meeting also came to the second meeting and conceded the election of Giwa and the new board had not been carried out in accordance with NFF regulations. The situation contravenes a directive by football's world governing body Fifa, who said a in a letter to the NFF last week that it must decide a new date for "an electoral process that is free and open to everybody". The developments on Tuesday have resulted in a situation where Nigeria are in danger of being suspended from world football for government interference. The disputes within the NFF have already led to a Fifa intervention, international suspension and the enforced return - twice - of Maigari. Another ban could affect Nigeria's 2015 Africa Cup of Nations qualifiers against Congo and South Africa early next month. In addition to the deep divisions in the NFF, the Super Eagles are still without a permanent coach after Stephen Keshi's contract was not renewed after the World Cup. He has agreed only to take temporary charge of the team for their two upcoming Nations Cup qualifiers, having grown impatient with negotiations over a new deal.